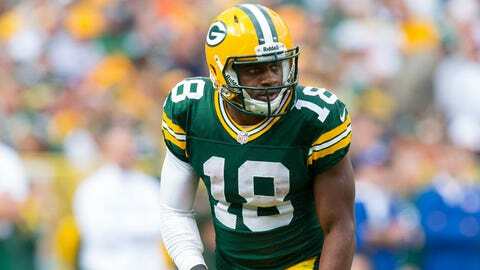 Randall Cobb has been out of action since being injured Oct. 13. Randall Cobb had said he was striving to play in Sunday’s game against the Chicago Bears. Cobb fractured his tibia against the Baltimore Ravens on Oct. 13 on a tackle by safety Matt Elam. He finally returned to practice last week and this past Thursday noted significant progress. "Today was the first day that I actually did some cutting and didn’t think about it," Cobb said after Thursday’s practice. "That’s definitely progress and that’s definitely confidence to me, for me, in my knee. I think that’s very important for the next step." An explosive player when healthy, Cobb has 29 receptions for 378 yards (13.0 average) with two touchdowns this season as well as four rushing attempts for 78 yards. In 2012, Cobb had 80 catches for 954 yards (11.9 average) with eight TDs and ran 10 times for 132 yards. Although he wasn’t used much on returns this season — he has just one kick return for 10 yards and three punt returns for 23 yards — he averaged 26.5 yards on kick returns with a TD and 16.8 yards on punt returns with two TDs from 2011-12.